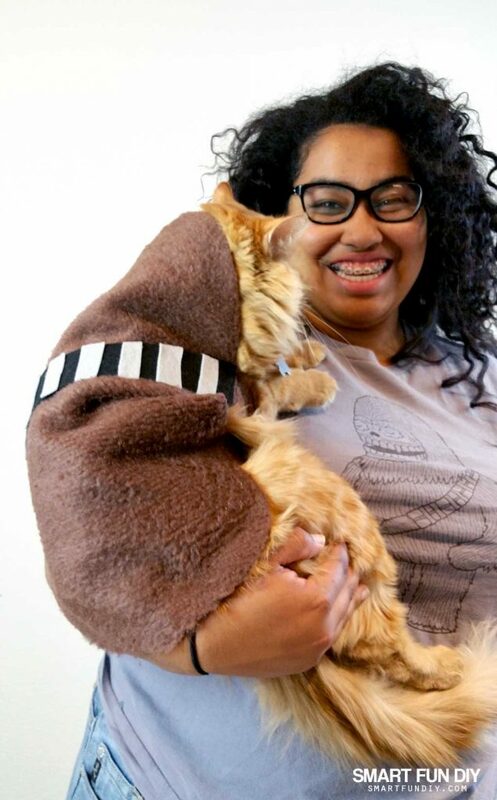 You don't have to wait until May the 4th to dress up your kitty as our favorite furry Star Wars friend, Chewbacca! This no-sew cat costume costs under $5 to make with supplies you can get really easily. Cute kitty by day, Chewbacca cat by night time! 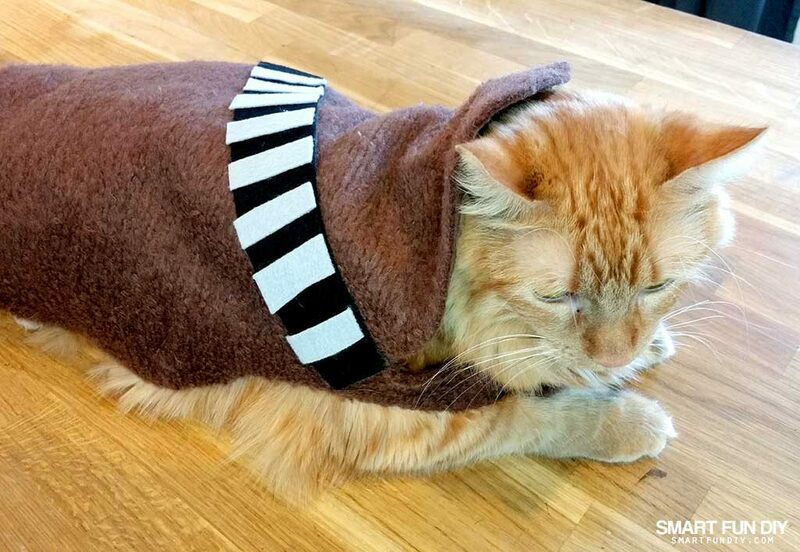 Let's dig in to see how to make this DIY Chewbacca Cat Costume for Star Wars Day on May the 4th, Halloween, or really any day. The key to this costume is to find a cheap small dog costume to copy. Head to your local 99 Cents Only Store to get a small dog costume that you can use as a pattern. Yes, it looks like a potato with skinny arms. You too can draw super awesome like me one day if you practice a lot … like, I don't know, 30 seconds *wink wink*. Ha! Enlarge the pattern on a copier or draw your own pattern to fit your cat using kraft paper or newspaper. 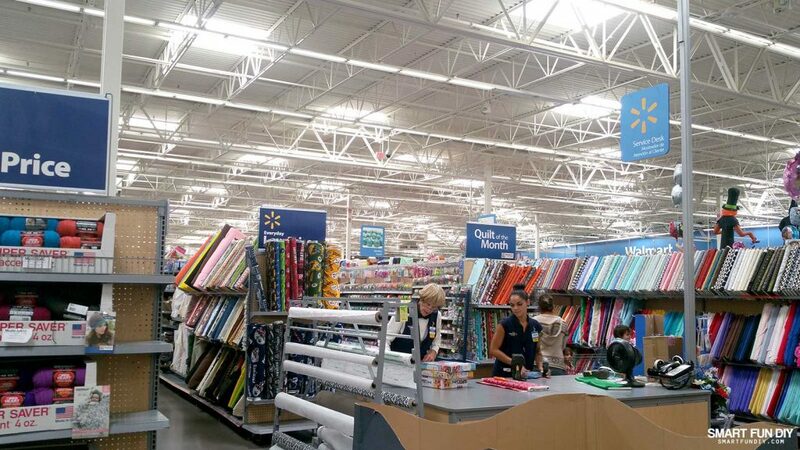 You can find the ShaggiFelt by the yard at your local Walmart in the craft area. 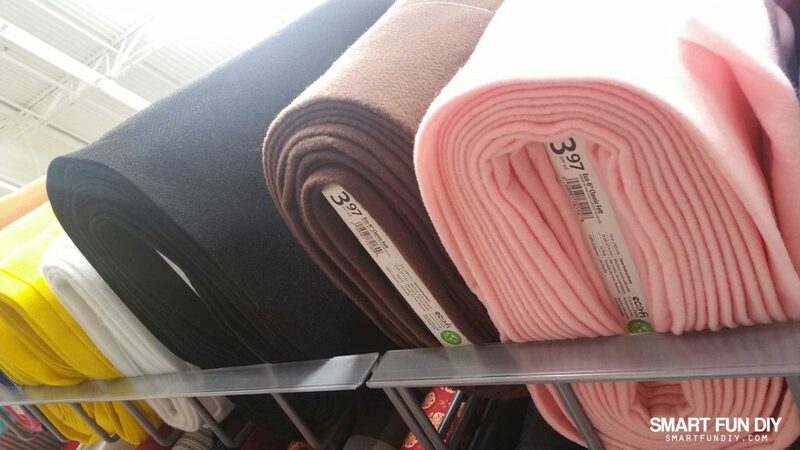 You'll need about 1/2 yard of fabric to make 2 costumes. 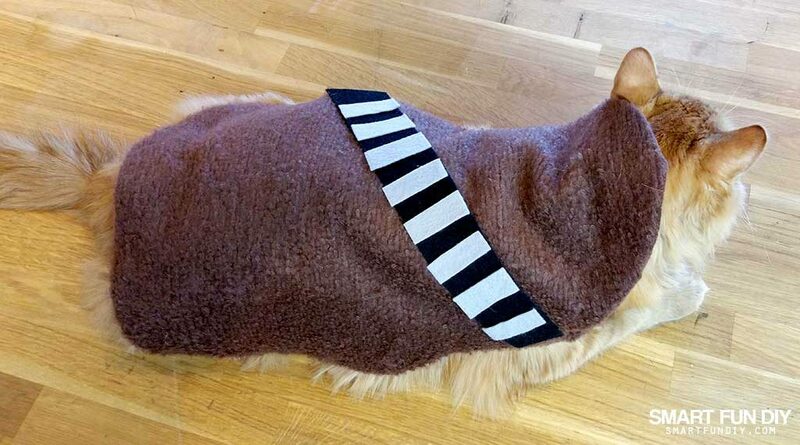 Add ears and change the bandolier to brown to convert this into an Ewok costume! Pin the pattern to a 1/2 yard piece of ShaggiFelt. Cut out. Cut a 2″ wide strip of PrestoFelt in Black. Cut a 2″ strip of Eco-Fi Felt in Grey. Cut the strip into 1″ wide pieces. Glue the 1″ wide pieces at 1″ to 1.5″ intervals along the black felt strip to make the bandolier. Remove the sticker back from the PrestoFelt and press to the back of the Chewbacca costume base. Add VELCRO Brand tabs to the fabric tabs on the Chewbacca costume. Watch this video to see how to make this costume using another costume as a pattern. It's super easy!